When fishermen or crewmembers working in Alaska are injured or fall ill, the U.S. Coast Guard is often called upon to medevac. But what if a vessel is far from assistance? In these situations, long-range medevacs are necessary. Follow the map to see the distances covered and the heroic effort that took place on Sunday, November 18th. Watchstanders at U.S. Coast Guard 17th District command center received a call that a 63-year-old crewmember working aboard the F/V BLUE ATTU was exhibiting symptoms associated with a stroke. 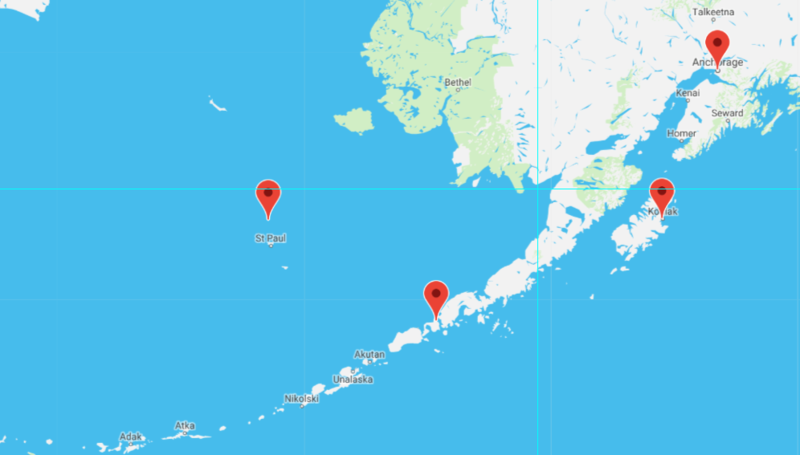 The Coast Guard flight surgeon recommended a medevac, and an MH-60 Jayhawk helicopter located at Cold Bay, Alaska set out toward the vessel location approximately 100 miles north of St. Paul. Watchstanders also directed an HC-130 Hercules aircrew from Kodiak to travel to St. Paul, and a second MH-60 Jayhawk aircrew was sent from Kodiak to Cold Bay to be on stand-by. After the Jayhawk helicopter reached St. Paul, refueling took place and the Jayhawk crew embarked a U.S. Coast Guard rescue swimmer who was brought to St. Paul by the HC-130 Hercules. The U.S. Coast Guard Cutter Healy was also in the vicinity of the medevac, and after the Jayhawk aircrew took off from St. Paul, they re-fueled on board the Healy again before transiting to the Blue Attu to conduct the medevac. The crew was forced to abort the medevac due to unfavorable conditions. However, the standby Jayhawk crew was able to successfully conduct the hoist and transport the crewmember back to St. Paul. He was then transported to Anchorage, Alaska for further care. His condition was reported as stable at the time of the transfer.